When it comes to garage door openers, there's no one better at repairing or installing them than our professional technicians. Regardless of where the problem lies, we can restore the unit's proper operation in no time at all. Some common problems your opener can experience are a worn-out motor gear or a fried electrical cable. We can take care of these issues for you with speed and efficiency, and we'll repair the damaged component right then and there, or replace it with one of a better quality. 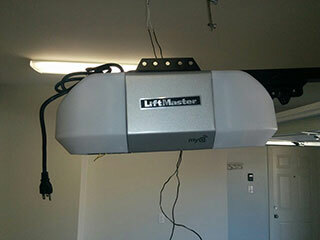 There are only a few things that are more aggravating than having to deal with a malfunctioning garage door opener. Whether it happens while you're in a rush to leave your house in the morning, or when you're tired and eager to get inside late at night, it is just a pain in the you-know-what to deal with. This is when routine maintenance can come in handy, or rather, it would have come in handy if it was being performed on your system on a regular basis. By making sure our expert technicians examine your system for faults, lubricate the appropriate sections, replace any part that's about to break and perform the necessary safety tests, you'll be able to avoid a lot of different problems. If you're looking to get a new opener for your garage door, then our team can help you with more than simply installing the unit for you. We can offer you a wide selection of different brands and models, each with its own special safety and security features. We'll take full consideration of the weight and size of your door, which will determine the necessary horsepower output, and the material that's best suited for your local climate. Then, of course, we'll install it to perfection. Our experts at Garage Door Repair San Mateo are here to help you with all of your opener needs. Call us for fast installation and professional repairs.